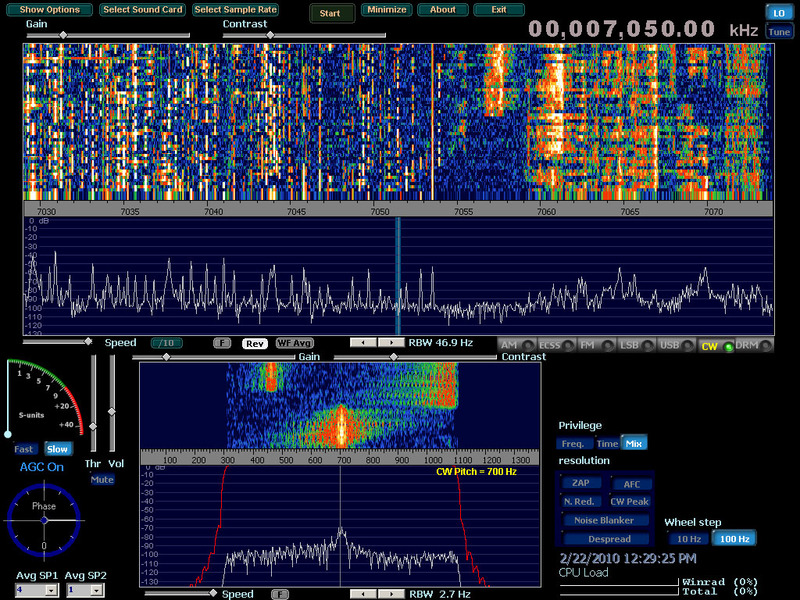 Winrad is a free amateur radio program conceived by Jeffrey Pawlan, WA6KBL, and written by Alberto, I2PHD, that implements many Software Defined Radio (SDR) functions which are needed for weaksignal reception including EME, troposcatter, cloudscatter, and very long distance microwave terrestrial contacts. It also works well for general HF reception. Winrad will accept input from any Windows soundcard, from Virtual Audio Cable, or direct digital input from several SDR receivers which have appropriate drivers written for Winrad in the form of a DLL plus support files. These files must be installed in the Winrad progam directory in order to run. You must do all installation and run Winrad with Administrator privileges. 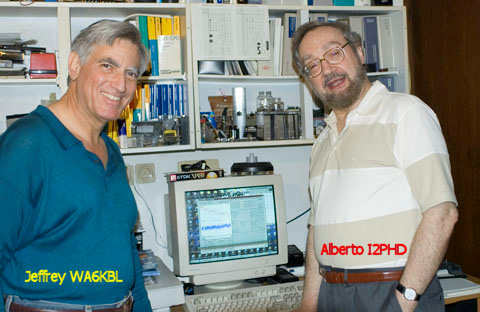 Alberto, I2PHD wrote the code from its beginning until retiring from it in Oct, 2008. Jim Austin and Charles Buse helped from 2008 - 2010. We do not have any programmers at this time. If you are interested in helping, note that you will need to use the Borland/Codegear/Embarcadero IDE version 2007. Please contact Jeffrey Pawlan. If you start from the original source code and make a new program that is not part of this project, please do not call it Winrad as this name is my own creation and the program Winrad will remain on this website which I own. All recent versions of Winrad run under Windows 2000, XP, Vista and 1.6.1 has been tested on Windows 7 (32 and also 64 bit) with a Perseus. An earlier version v1.23 is also provided because it will still run under Windows 98SE. There are problems with Windows 10. The yahoo discussion group for Winrad has been inactive for a long time so it will be discontinued. The last radio used is saved so when you start Winrad again your radio will be automatically selected. The last state of the I/Q mode is stored so if you use I/Q swapped, Winrad will remember that and come up with this selected. The issue of the Internationalization: use of "." or "," decimal fraction separators depending on country has been fixed. New: you may adjust the parameters of the AGC buttons by right-clicking on them. A pop-up window will appear and you can change the values. Slow and Fast AGC are separate except for one common parameter. Note that you can "break" Winrad by moving the values too far. You must have the Threshold slider up most of the way or perhaps all of the way to really hear the effects of the AGC. Important! Before installing the new version, please read this. Winrad v1.32 should be renamed to winrad132.exe so that it will not be overwritten when you install the new version. You can create a separate desktop shortcut for that. 2. You must uninstall the earlier version (1.4.2 to 1.5.0) before you install 1.6.1. This is done in the Windows Control Panel using Add / Remove Programs. Download the support files for the RFspace SDR-14 and SDR-I/Q receivers. Download the support files for the Perseus Direct Sampling Receiver from the Perseus home page. The extio .DLL is written correctly and reports whether it is really plugged in and powered on or not. Get the new SDR HF receiver designed and made by Martin Pernter, IW3AUT called PM-SDR. His webpage includes a DLL to use his receiver with Winrad. Download the support files for the Elektor SDR receiver published in the May 2007 issue of Elektor. But the extio DLL is not written correctly and does not report if the radio is unplugged. The Author has not replied so far.